Surrounded by the beautiful Abruzzo’s hills, the Oil Mill Tini is family managed on a continuous basis with care and passion since 1921. Handed from generation to generation, the family members have always kept the high standards of quality of the olive milling and the olive oil production. a cutting-edge processing and a controlled production of an excellent quality olive oil. 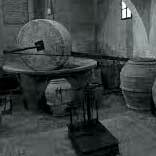 This is a family story that began 1921 when Antonio Tini opened the first Olive Mill in the small town of Castilenti. The headquarters of the company is still on the same enchanting place, situated in the wonderful hills of Abruzzo at 330 meters above sea level. First operator in the area, Antonio Tini, introduces the ancestor of the "modern" oil mill with the aid of machines moved by human and animal force. The pans mill were set in motion by a horse and a wooden screw press was operated by two people, the separation of the oil from the vegetation water was a delicate task and reserved to the master operator with the help of tin tools, such as "coppa" and "mappo". “Trappéto” (from the Latin trapetum, and the Greek trapetes) means ‘press’ and is the derivative from trapêin – ‘to break’, ‘to squeeze’ (olives or grapes) indicating the place where the olives were pressed to extract the olive oil, otherwise called the oil mill. In 1936 with the introduction of the first cadastral maps in the area, Antonio Tini had officially laid the foundation for a story of quality, tradition and innovation, called “Trappeto Tini” and based on the area where the plant still exists. He passed down the company to his children in 1950 and this tradition is still being practiced today. In this decade we have the first forms of mechanization. 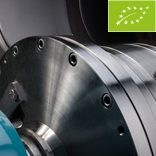 The inclusion of the combustion engine between the machines revolutionised the production process. Through motion belts distribution the “Lombardini” hot head system diesel powered engine allowed to operate the millstones and the hydraulic pump by squeezing through hydrodynamic presses. The stacks of olive paste were made of coconut fiber diaphragms. These innovations allowed to raise the production per hour up to a maximum of 100 kg of olives pressed in one hour. The separation of the oil from the vegetation water was still carried out through the aid of tin tools. 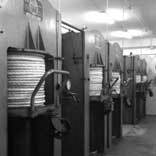 In 1962, the area is served by “power driving force” for the first time, this was a new breakthrough in oil mill production. At that time these machines were considered quite innovative. 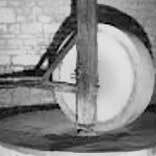 These included: electric lift for loading olives in the millstone’s bathtub, two millstones in granite stone, electric dosing machine of olive paste, 2 presses with hydraulic pump, pump for vegetation water and olive oil. The brothers Pietro and Vincenzo introduced the first centrifugal separator in the area for the separation of vegetable water from the olive oil. The manual separation of the olive must is abandoned and replaced by a much more accurate production process. THE OIL MILL WITH "TRADITIONAL METHOD"
In 1980, thanks to the determination of Carmine Tini, another progressive action was taken. The olive mill was renovated thanks to the acquisition of a new processing plant which followed the principal of the“traditional method”. 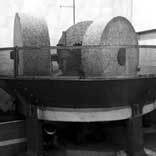 The number of granite Millstones was increased to 3 and they were enlarged, the number of presses was also raised to 5 and two separate machines were inserted in the process, one of these which featured an automatic discharge. 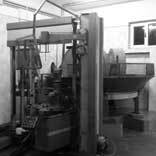 These machines raise the certified production capacity to 0,8 tons of olives pressed per hour. Furthermore, the oil mill was enhaced by a leaf stripper and a new automatic stacker. For better organisation and to cut time constraints a new reservation system aimed at gathering and pressing the olives was introduced. This became an essential requisite for high quality production. Special attention is still given to the storage of the olives before the pressing (storage in ventilated protected rooms). In 1999 Vincenzo formally joined the company, constituting with his father Carmine the community that still manages Frantoio Tini. Also Vincenzo is an expert of the olive mill having learned the art before from his grandfather and then from his father. The technology has improved over the year the estraction installetions to minimize olive paste oxygenation and its conseguent oxidation and lower, as much as possible, the processing tempertures. Based on these principles, the Frantoio Tini has re-innovated its Oil Mill moving from a traditional system to a modern type system, also called a continuous cycle. The choice of using this type of system is born from the intention to obtain an Extra Virgin Olive Oil of high quality. Only the combination of human experience, technology and innovation allow to achive this result. The working process pass through different stages briefly described following. The olives come in the Oil Mill and are stored in appropriate bins, they will be milled strictly within 24 hours. Once defoliated and washed, the olives are sent to the crusher the latter realises a continuos formation of olive paste. The paste in its turn passes through a process of kneading in the kneader closed at controlled temperature. Subsequently the olive paste, mixed in determined proportions to the water, is sent to the decanter that divides it into three components: olive pulp, vegetation water and oil must. The oil must and part of the vegetation waters are sent to centrifugal separators. The oil, during its working process is "cold extraction" with temperatures below 27° C. The product obtained may contain solid impurities in suspension, for this reason needs a period of decantation or a natural filtration process, that is without the use of chemicals. These attentions completed the produduction chain: the proper conservation of the oil to protect from heat sources, light and oxygen and an optimum storage temperature between 14° and 18° C.
the oils that have passed all previous tests are packaged in cans or bottles. The packages are labeled and wrapped for shipping. Each packaged bottle has its unique code that allows you to trace all the information on the oil.